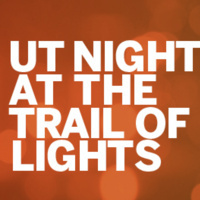 Let's paint the Austin Trail of Lights burnt orange on UT Night, Dec. 16, 7-10 p.m. UT students will be performing on the stages throughout the evening. Special zip entry passes are available to allow UT students, faculty and staff get on the trail an hour ahead of everyone else at 6 p.m. and give access to the UT tent which has free hot chocolate, cookies and special activities. Visit https://austintrailoflights.org/ut-night to buy a general admission ticket for $3 or a zip fast entry pass for $20. Students may use a special code longhornsTOL18 for a discounted ticket or zip fast entry pass https://bit.ly/2qtubn7.